Fifteen of the OHL’s top 2019 NHL Draft prospects hit the ice tonight in one of the biggest games of their young careers. Hundreds of NHL scouts will descend on The Centrium in Red Deer, Alta. for their only opportunity to see 40 of the CHL’s best in action as the 24th annual Sherwin-Williams CHL/NHL Top Prospects Game gives players a chance to shine. OHL standouts and eventual first round NHL selections Ty Dellandrea (Flint Firebirds/Dallas Stars) and Evan Bouchard (London Knights/Edmonton Oilers) both put a dent in the event record books last year in Guelph. Here’s a glimpse at what the OHL has to offer headed into tonight’s action that can be seen live across at the country on Sportsnet and TVA Sports as well as in the United States on NHL Network beginning at 10:00pm ET/7:00pm PT. Smooth-skating defenceman made a mid-season move to Kingston where he has seen ice in all situations, putting up 10 points (2-8–10) in 21 games on a young Frontenacs team. Constantinou will line up against former Toronto Marlboros Minor Midget teammate Graeme Clarke. The OHL’s top-ranked player in the NHL Central Scouting midterms released on Monday. Harley continues to grow into a 6-foot-3 frame and is a presence in all three zones. He was Mississauga’s first round pick in the 2017 OHL Priority Selection. Hamilton’s scoring sensation continues to produce, already eclipsing his impressive rookie total of 31 goals last season. Kaliyev, who cites his favourite NHL player as Tampa Bay’s Nikita Kucherov, helped steer the Bulldogs to an OHL title last spring. Tenacious forward played an instrumental role in Canada’s Hlinka Gretzky Cup gold medal won in Edmonton last summer. Though he’s battled injuries, Rees has been a proven competitor with the Sting, recording 23 points (8-15–23) over 24 games this season. An energetic player that brings speed and skill offensively. Robertson models his game after similarly statured NHL forwards in Johnny Gaudreau (Calgary Flames) and former OHL Player of the Year Mitch Marner (Toronto Maple Leafs). A big fan of the Los Angeles Kings, Robertson was Peterborough’s Rookie of the Year last season. Big defenceman joined the Rangers midway through last season after being a second round pick in 2017. Vukojevic gained valuable experience helping the Rangers reach the Western Conference Final last spring. Former fourth round pick of the Hounds in 2017 has developed into a dependable two-way centre. Cites Buffalo’s Jack Eichel as his favourite NHL player and is eager to play for Team Cherry after watching head coach Ron MacLean on Hockey Night in Canada throughout his childhood. Carroll gives the Greyhounds a record nine straight years with a player competing in the event. Another Ottawa-area talent, Graeme Clarke has developed a reputation for scoring highlight reel goals. The right-winger recently eclipsed his rookie mark of 14 goals, netting 15 as a sophomore through 32 games this season. The Toronto Marlboros grad was a member of Canada’s gold medal-winning Hlinka Gretzky Cup team last summer. The son of a long-time Russian professional player, Guskov joins Knights teammate Connor McMichael on Team Orr. Guskov recently represented Russia at the World Junior A Challenge and has 21 points (7-14–21) over 35 games in London this season. Speaks very good English despite coming over from Russia at the start of this season. 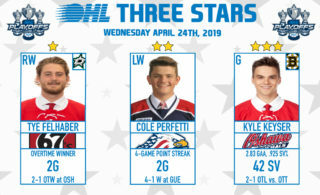 The OHL’s top-ranked goaltender is second among North American netminders on the NHL midterms. Jones, who represented the OHL in the CIBC Canada-Russia Series, has been a workhorse in Peterborough this season, appearing in 39 games. Cites Tampa Bay’s Andrei Vasilevskiy and Toronto’s Frederik Andersen as his favourite NHL netminders. Belarusian talent has an offensive side from the back end, putting up 23 points (3-20–23) in 34 games with Flint this season. Says his ultimate goal is to someday win the Stanley Cup. Former first round pick in the 2017 OHL Priority Selection was acquired by the Knights midway through last season. Has enjoyed a successful sophomore season in London, putting up 51 points (27-24–51) over 43 games. The Knights have had a record 31 players compete in the event since 1996, a figure that includes McMichael and Guskov. Smooth-skating defenceman that loves the physical side of the game. Okhotyuk is a late-2000 born talent that has carved out a role on Ottawa’s experienced blue line. Helped Russia win bronze at the 2018 Hlinka Gretzky Cup. 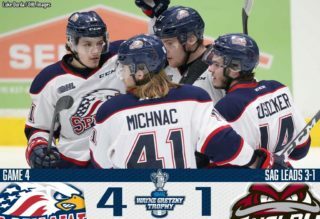 Former first overall OHL Priority Selection choice having a successful season in Barrie, equalling his rookie total of 44 points (15-29–44) over 41 games. Former ALLIANCE Hockey Player of the Year wears #61 because of John Tavares, who wore the number during his time with the London Knights. 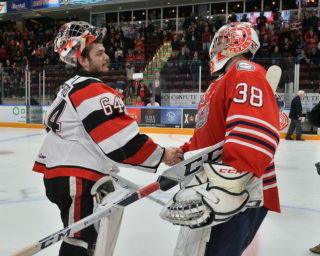 Enjoys suiting up against older brother Nick (Guelph Storm) when he has the opportunity. 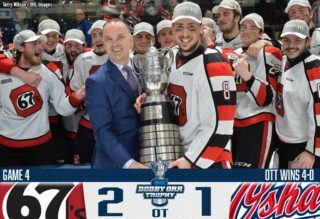 A young, but valuable piece of the puzzle for an experienced Niagara IceDogs club. Tomasino has registered 47 points (22-25–47) over 44 games as a sophomore after being Niagara’s first round pick in the 2017 OHL Priority Selection. Plays the game with speed and names New York Islanders forward Mathew Barzal as an inspiration. For full coverage of the 2019 Sherwin-Williams CHL/NHL Top Prospects Game, visit sherwinwilliamstopprospects.ca.